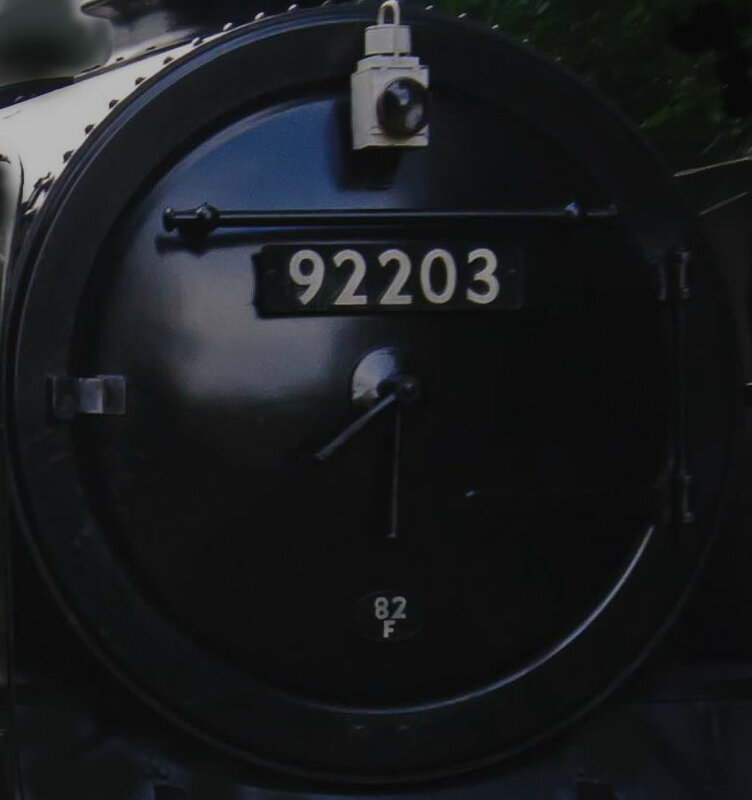 ; being the 999th Standard class and final steam locomotive to be built by BR. The 9Fs had a working order weight of 139 tons, carried 7 tons of coal and 5000 gallons of water, and could pull freight trains of up to 900 tons at 35 mph (56 km/h). 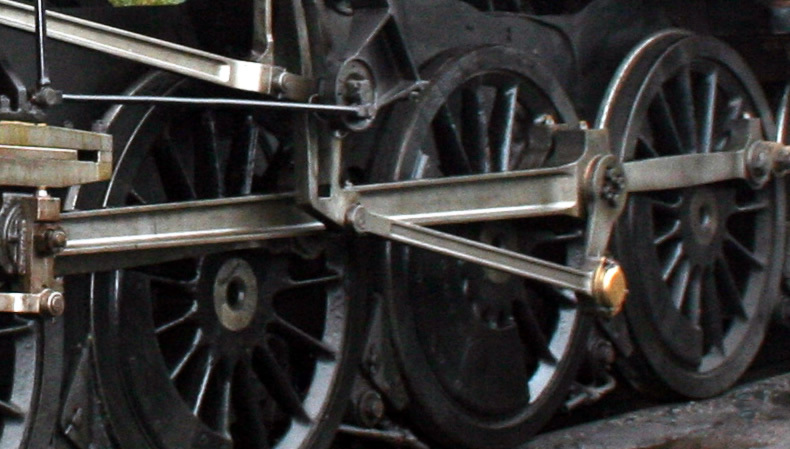 The 9F had an interesting driving wheel arrangement that distributed adhesion over five axles. Whilst this produced an axle load of only 15.5 tons, the designers identified various problems in adopting such a long wheelbase that required several innovations. To allow the locomotive to negotiate lines with tight curves, the centre driving wheels had no flanges, whilst those on the second and fourth axles used a lower profile flange; this allowed the 9Fs to round curves of a radius as tight as 400 feet (120 m). However, in order to clear the rear “drivers” the firebox grate had to be set higher, thus reducing its volume. This resulted in the 9F’s characteristic gap between the boiler and chassis. The 9Fs had a short mainline working life: sadly, withdrawals began in May 1964 and were completed by June 1968. Nine 9F locomotives were spared from being scrapped and survived (in varying condition) into the thriving heritage and preservation era – these included Evening Star and 92203. 92203 was one of the first 9Fs to be built [Swindon, 1959] and, as a result, had a working life of less than nine years. It worked the final steam-hauled iron ore train in November 1967, from Birkenhead’s Bidston Dock to the Shotton steelworks. Fortunately, the locomotive was saved when it was formally withdrawn from Birkenhead shed and purchased by the artist and wildlife conservationist David Shepherd for £3,000 and moved to the Longmoor Military Railway (LMR) in Hampshire. 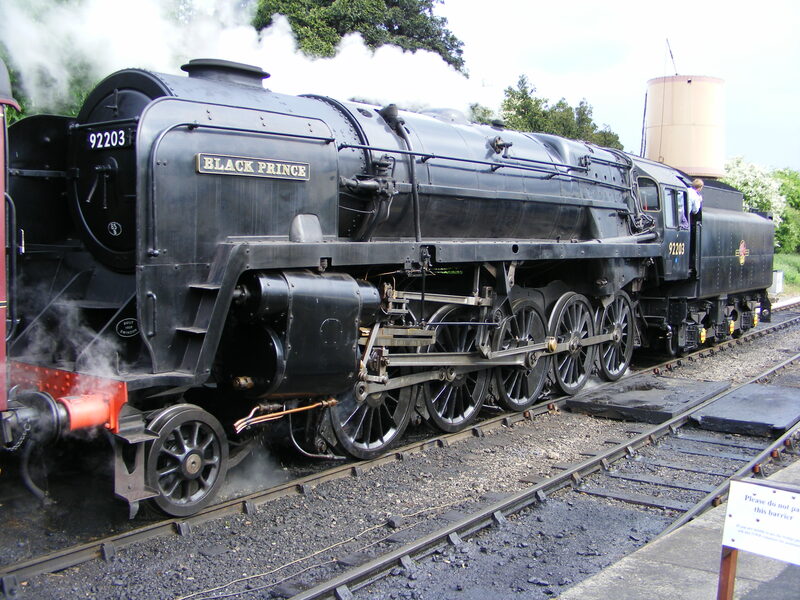 David Shepherd also chose to name 92203 Black Prince. 92203 then moved to the Eastleigh depot when the LMR closed and, in 1973, moved to the East Somerset Railway, remaining there until 1998. During this time Black Prince also visited other heritage railway sites (including the East Lancs and the Mid Hants railways) and achieved the distinction of hauling the heaviest ever freight train in the UK in September 1982 (2198 tons, at Foster Yeoman’s Torr Works in Somerset). 92203 was later overhauled whilst at the Gloucestershire Warwickshire Railway (Flour Mill workshops) in 2004 and was the railway’s largest resident locomotive until 2010, when she was then moved on extended loan to the North Norfolk Railway. The locomotive is currently stored, out of service. Interestingly, Black Prince has featured in two films: a BBC TV documentary, produced in 1972 by the late James Stewart, about David Sheperd and titled “The Man Who Loves Giants” and also in the 1972 film “Young Winston”, directed by Richard Attenborough and about Sir Winston Churchill’s early life. This entry was posted in Railways and tagged 9F, Black Prince, BR Standard Class, British Rail, locomotive, Preservation, Steam. Bookmark the permalink.